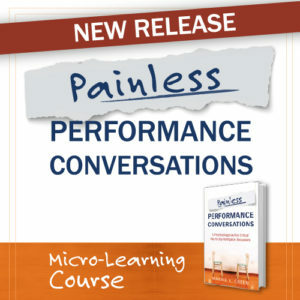 Prositions Releases New Micro-Learning Program, Painless Performance Conversations | Prositions, Inc. Prositions Releases New Micro-Learning Program, Painless Performance Conversations | Prositions, Inc.
Prositions, Inc., the creator of DashTrain, is announcing the release of a new micro-learning program based on the best-selling book by Marnie E. Green, titled Painless Performance Conversations. The new blended training program includes eLearning, classroom, and performance support formats along with a suite of customizable resources to help administrators and trainers facilitate a tailored learning experience for supervisors who want to improve employee and team performance. Painless Performance Conversations was designed for use with executives, managers, supervisors, and team leads to teach the skills needed to conduct performance-related conversations with confidence and poise. The program features Marnie Green’s four critical mind-sets to help supervisors prepare for painless performance conversations. It also presents a number of effective behavior models with actionable and practical day-to-day advice. Interested organizations can request a free demo of Painless Performance Conversations by visiting the website or calling (515) 864-7200.